Score With These 8 Easy Tailgating Recipes! — Pip and Ebby - easy, delicious recipes! The game is on and friends are over. Time to enjoy some good food! You’ll want to make a variety of foods that are savory, easy to eat and delicious from the start to the end of the game. Pip and Ebby shares their favorite Tailgating Recipes with you for all the games you watch! These are going to hit a home run with your tailgating crew! They are so delicious and flavorful. The Baked Cheesy Sliders will go down easy with a brewski and fill you up as you cheer on your favorite team. Everyone loves these appetizers! Each bite size Honey Garlic Smoky can be enjoyed between cheers for your team, opposite bites of your favorite dessert or main dish. Whether you have one or many, you will enjoy this snack immensely. You will need a crunch during game time and these buttery garlic pinwheels enhanced with the right amount of herbs will do the trick. These are a simple snack to put out during the game but so easy and worthwhile to serve up to your guests. This medley of snacks is a great way to enjoy the sportsmanship of a game. It’salso a fun finger food that doesn’t take a lot of preparation. Antipasto Skewers are the perfect party food! This is a hearty, delicious, warm appetizer that will be underappreciated until that very first bite. Using a corn tortilla or pita bread, whatever you choose to dip with will be eaten quickly so you can go after another bite. 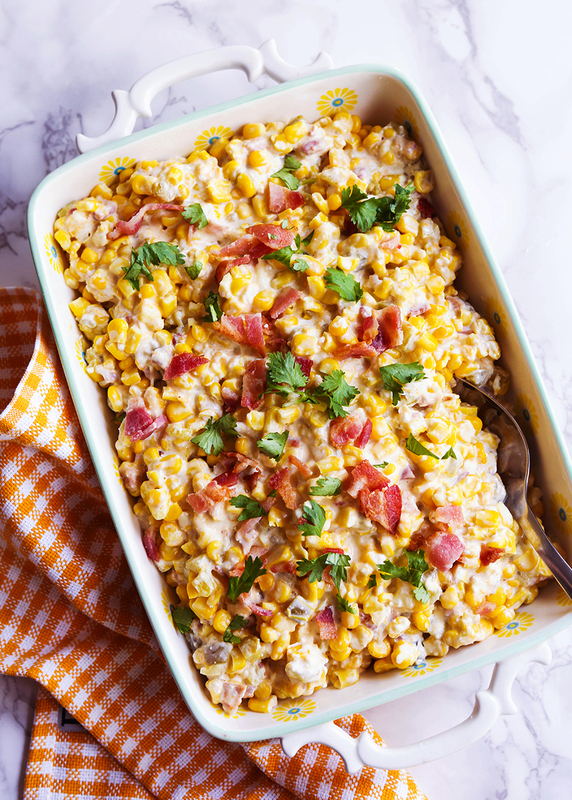 This Hot Corn Dip offers lots of flavor and will be enjoyed by all. If Buffalo Wings aren’t a staple at your tailgating party, you need to ask yourself why not?! This is a delicious recipe that is finger licking good, best dipped into a homemade blue cheese dressin/dip that is insanely good! Your guests will make sure there’s no leftovers to bother with. This combination of cream cheese, deli meat and dill pickles is too good to pass up for your gathering. And you better buy the big container of pickles, because these will go fast! With only 3 ingredients needed to put these together, Pickle Rollups are a simple recipe that won’t consume all your getting ready for the party. It’s a perfect appetizer that’s low on carbs and high in taste! We saved the best for last! This is an amazing dip, filled with layers of amazing flavors mingling together. It’ll be the first appetizer that will be devoured. Each bite will be savored. Don’t miss out on this amazing recipe for the Best 7-Layer Taco Dip!